The fashion scene is always rapidly changing every season and it can be difficult to keep in track. The easiest way a woman can look stylish and never fall as a fashion victim is to appear simple with casual outfits. There are various pieces you can pull together to create the perfect casual look. People often think that casual translates to sloppy and that isn't the case. With the right pieces, you can turn you simple casual look into something amazing. For the ladies who do not have an idea of how to pull together a nice casual women’s fashion look, check out the Top 5 chic casual outfit ideas to try. Instead of throwing on a nice basic tank top and skinny jeans, you can spice up the outfit with a stylish leather jacket and sky high heels. Simply combine casual and edgy clothing together for that trendy casual look. The jacket definitely perks up your simple tank top. It cannot be denied that there are times when you do not feel like you want to dress up. If you have those lazy days but still wants to remain stunning in the eye of the public, go for something loose fitting. Slip on a nice pair of loose boyfriends jeans and oversized tee for a comfortable yet trendy casual outfit. You name it, the tomgirl look. Another way to prep up your casual day outfit is to switch those plain tees with printed ones. As you realize, there are plenty of printed t-shirt designs with creative words to choose from. Choose one which represents your personality and match it with a nice pair of coloured jeans for that funky touch. Step out feeling confident and expose a young vibe with comfort. Here's another casual look that makes you look younger. Pair up with a straight leg jeans and plain cropped top, simple yet fashionable at the same time. If you are having a bad hair day, put on a cute beanie and choose your favourite pair of shoes to bright up your day. Plain maxi dress with a sports shoe to spice up your lazy day. Denim jacket wrapped around the waist can be a decoration for your plain maxi dress. This feminine look gives a sporty yet cheeky feel for yourself. What's the best of all? You do not need to think of pairing the top and bottom pieces if you are wearing a dress. 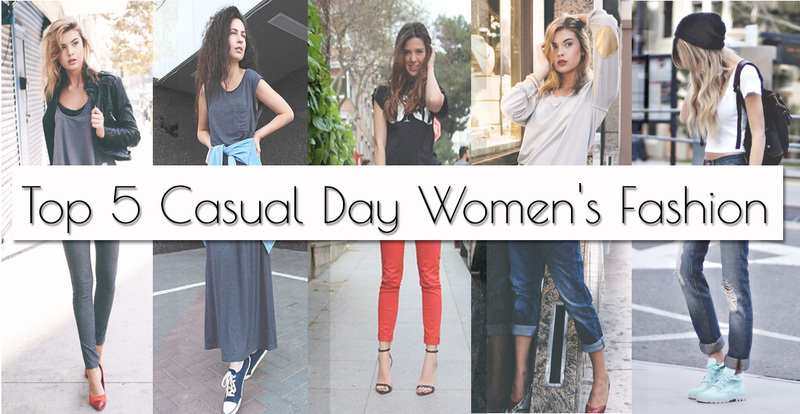 So, which one is your casual style for a lazy day?